The Supreme Court on Tuesday reportedly denied the transfer of Essar Steel India Ltd’s Rs.250 crore defamation suit against Delhi-based magazine The Caravan. The Bench, comprising Justice Gopala Gowda and Justice Amitava Roy refused to intervene at this stage and directed Caravan to file its response in Ahmedabad Court, which is due today. The Court however granted it the liberty to approach the Apex Court at a later stage, if situation arose. Representing the magazine, Advocate Prashant Bhushan argued that Essar’s petition was a Strategic Litigation against Public Participation (SLAPP) suit, solely for the purpose of harassing the magazine. He also submitted that none of the actions leading to the alleged defamation had occurred in Ahmedabad and hence, Delhi was the appropriate forum for the same. He hence pleaded that justice calls for such a transfer. Last month, Essar Steel Indian had filed the Rs. 250 crore defamation suit in the Ahmedabad City Civil Court against Caravan, its publisher Delhi Press, several of its editors and staff reporter Krishn Kaushik. The Suit, filed by Gujarat law firm, Nanavati Associates, seeks a temporary injunction and ex parte order to restrain the defendants from “in any manner publishing, issuing, circulating, distributing or advertising in any manner whatsoever either in print or electronic or any other form of media any defamatory story or article concerning the Plaintiff”, claiming that there is a “clear cut and strong prima facie case” against Caravan. 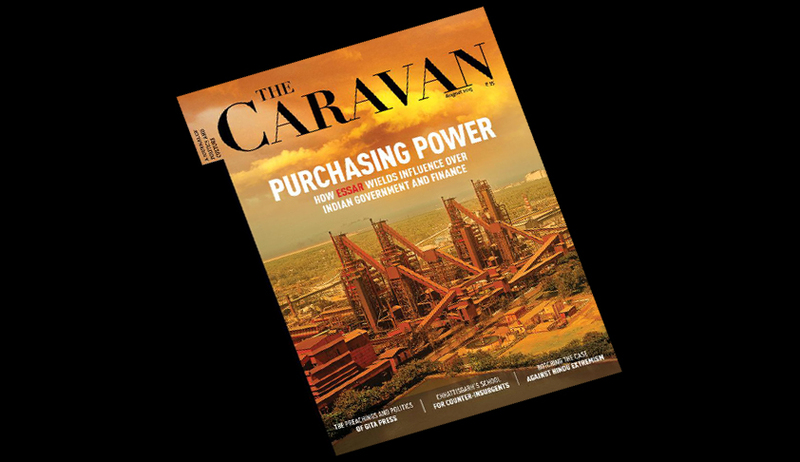 It has reportedly alleged that Caravan’s story “Doing the Needful: Essar’s industry of influence” and “Purchasing Power – How Essar wields influence over India Government and Finance” (published in its August 2015 edition) was defamatory and made “several imputations… to harm or knowing or having reason to believe that such imputations will harm the reputation of Essar… without any lawful justification and thereby, defamed Essar, including the Plaintiff and its promoters”. Two legal notices were sent by Essar. The first was reportedly sent via Supreme Court advocate Abhimanyu Bhandari on 21 July in relation to Caravan’s online story titled “How Essar Handed Out 195 iPads as Diwali Gifts to Top Politicians, Bureaucrats and Journalists in 2010”. The second notice was sent via Supreme Court advocates Agarwal Law Associates on 8 August. The Caravan responded to both the notices on August 18. Defending the veracity of the cover story, the reply called the notice “a malicious, motivated and illegal attempt to suppress the truth”. Essar responded the next day, August 19, filing a civil defamation suit of Rs 250 crore on The Caravan. It has sought damages to the tune of Rs. 250 crore as “a genuine pre-estimate of the damages suffered by it considering that it is a part of a large conglomerate ‘Essar’ which has investments in various sectors such as steel, energy, infrastructure etc and having operations in more than 29 countries across 5 continents and the worldwide goodwill and reputation that it holds”. Last month, City Civil and Sessions Court judge J.V. Pandya had granted time till September 9 to 'Caravan' magazine and six others to file their replies in the suit. The series of articles published by the website had triggered a Public Interest Litigation filed by the Centre for Public Interest Litigation, demanding a Court monitored investigation into “the high level of political bureaucratic corporate nexus wherein corporates use their money power to change public policies, plant questions in Parliament, get access to internal government documents/cabinet papers, grant favors to politicians and bureaucrats for receiving benefits in return, and plant stories in news media.” You may read the LiveLaw story here. In the affidavit filed in by CPIL in May this year, several allegations were made regarding politicians and bureaucrats indulging in quid pro quo and as well as framing policies in a manner that suited Essar. CPIL has relied on Essar’s internal emails which were provided to the NGO by a “reliable source”. You may read the LiveLaw story here.